Lecturing is the most employed tool for information transmission in higher education. 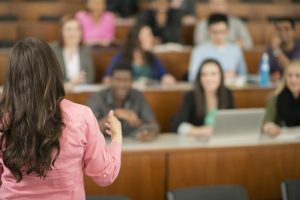 Lectures help when student wrestle with particular difficult topics. A teacher who has the ability to explain concepts in a simple yet effective way can be a big help. Take your time, don’t be afraid of pauses. Make sure your pauses are long enough to let what you have said sink in. The more nervous or uneasy you feel the more uneasy your audience will feel as well. When recording, have a one-on-one conversation with the camera. Look straight into the camera and make eye contact. Blink normally. Just be yourself and let your personality shine through.